Hey y'all! Well, you probably knew this was coming :) Today’s post is our autumn bucket list! It was so much fun to create the summer one that I just had to do an autumn one, too. Oh, and if you have anything to submit for the winter bucket list (hey, better to get an early start than late!) let me know by commenting down below! Happy fall, everyone! The autumn season is only 2 days away, and hopefully soon the weather will drop a bit! Hey y’all! Before fall arrives, I wanted to give you a bit of fall inspiration that I think would be helpful for all of us. I recently saw this idea, and I know it really inspired me, so I wanted to pass it on to you! Hey y’all! On Friday I finished another set of 8 cards without words, so in addition to the 8 other cards I have and other post topics I am planning on doing in the next few months, I’ve probably got enough pictures and ideas to post twice a week this fall! SO… that’s my fall goal! To blog twice a week! The second day I post each week, I will either post on Thursday or Friday, but most likely Thursdays since I will be quite a busy bee on Fridays during the school year! Hey y’all! For a minute there I forgot that today’s my blogging day – whoops! :) Well, today I chose to feature another card with no words. Instead, my focus point is one BIG flower! Hey y’all! I apologize for the missing Monday post yesterday. My Monday post for this week was pushed back a day due to a short overnight family vacation, so today I buckled down and took a ton of card photos. I already have photos now for about 8 Mondays! So, for the next 8 weeks, my Monday posts should be pretty regular. Hey folks! All you s’mores lovers are going to LOOOVVVEEE my post today! It’s s’mores dip! I made it for the very first time on Friday and it was absolutely divine! Card Inspiration // Cards Without Words?? Late last year I received an order of cards that... had no words? For a minute, I thought she had meant something else. But no, she had literally meant a card that had no words on it, inside or out. 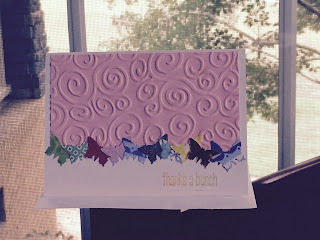 I am so used to getting orders for birthday or thank-you cards, so the thought had never crossed my mind that I might get card orders for cards that had no words on them! So, a bit challenged and nervous about how I would accomplish this task, I began work on the set. Blogging Changes - I Need Your Help! Hey y'all. I know I've probably been really confusing with blog changes, so I wanted to take a moment to share what I've been up to here and ask you for your advice. I am super excited about the post for today, y’all! It’s a super easy yet beautiful necklace that you can DIY in just minutes! It’s made using 3 things you probably have laying around your house – cord, a washer, and a few beads! Is that easy or what? Hey y’all! A few weekends ago I went on a camping trip – my first ever camping trip! Yup, I’ve never actually gone camping before in my life. And what’s more, I’ve never slept in a tent. I’ve only hiked 2 or 3 times. I’ve never sang around a campfire. I’ve roasted hot dogs over a fire at max probably 7 times. This is a delicious meal of simple, easy salads. I hope you like it! Hey y'all! 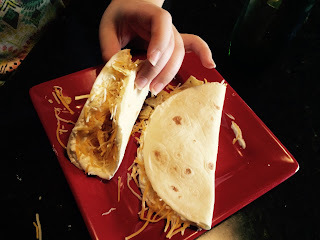 I haven't blogged in more than a week, so I thought I'd pick up regular blogging again. I thought that it'd be nice to share my favorite sour cream recipe, to go along with my blog title! Hey y’all! 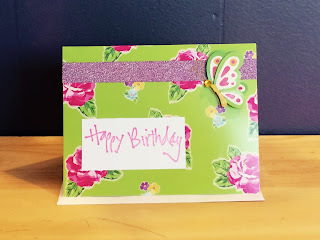 Today I want to show you this adorable pink and green glittery birthday card. The big summer holiday is almost here! July 4th! I’d like to share some ideas if you’re looking for some 4th of July celebrating inspiration. Here you go! Hey everyone! Hope you're having an awesome summer so far! Although grueling from the heat and scorching sunshine, summer is the perfect time in which to jump in the pool, have friends over, enjoy ice cream cones, and laze around with a good book. But sometimes, as school finishes up and the weather gets hot, you get a little bored. What do you do? Well, I created a summer bucket list to inspire you! It's almost July, can you believe it?! Wow, it seems like just yesterday it was Christmas, but really, half a year has gone by already! I'm really excited about the 4th of July coming up, as well as some awesome things for my blog! It’s that time of year again. Or, rather, the end of that time of year… graduation time! So, as the deemed card-maker for my family, of course I got some orders for graduation cards. And I’d like to share with you my favorite graduation card I have made yet! Hey! Today I want to share with you how to make a useful DIY diffuser necklace that is so fun to make and wear! The clay soaks up essential oil, and gives off whatever scent you placed on it. This is a neat way to take your favorite scents with you – and how better to do that than wear a beautiful necklace? Hi, and welcome to my blog, Sour Cream and Chips! I am a daughter of the One true Lord, and lover of playing the piano and flute, writing, making things, and sour cream.